For centuries, lamb has been the traditional meat of Easter and springtime. This was largely due to the seasonal nature of the meat, with good lamb only being available in the spring. Today, top-quality lamb is available year-round. 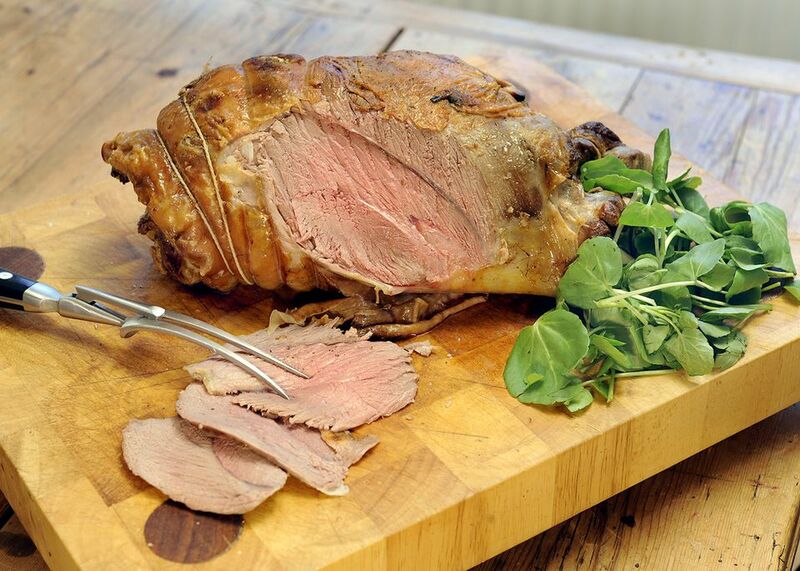 Whether you are looking for a traditional Easter dish or a great festival meal, consider a flame-roasted leg of lamb. There is a great deal of versatility in this cut, but it is special when grilled on a spit over a fire. Slow roasting on a rotisserie grill keeps the lamb tender and moist while adding so many flavors. You can purchase a leg of lamb either boneless or bone-in. A boneless leg is sold either butterflied or rolled and tied. The butterflied leg is great for grilling without a rotisserie. This cut has a consistent thickness and will cook more evenly. Whether bone-in or rolled and tied, you will want to use a rotisserie to grill the leg of lamb to get the necessary evenness and also helps to avoid drying out the meat. To grill a great leg of lamb, start with a marinade. Since lamb already has a strong flavor, choose a marinade that has plenty of flavors. Lemon, garlic, and herbs like rosemary and cilantro are good flavors to work with. The marinade should also contain enough vinegar to help carry the flavors deep into the meat. For a boneless leg, plan on marinating the meat for about four to six hours, for a bone-in leg try marinating overnight. Let the leg sit at room temperature for 30 to 45 minutes before you put it on the grill. With the leg marinated, it's time to grill. The leg of lamb will need about 20 minutes per pound to cook, so plan accordingly. Since a leg of lamb can weigh in at as much as 8 or 9 pounds, you will need to grill it indirectly over a medium fire for nearly the entire cooking time. This will take a few hours depending upon the size of the leg, but it's this slow roasting that will make it flavorful. A bone-in leg will take longer to cook than a boneless leg. Start by grilling the leg over medium-high, direct heat to sear the surface. This will give the meat a crusty surface and add texture. If you are not using a rotisserie, turn it every five minutes to sear the surface evenly. On the rotisserie, you won't have to worry about this. Either way, grill over direct heat for about 15 minutes. Watch for flare-ups during the direct grilling phase. Then move to indirect grilling and cut the temperature down to medium. Always use a meat thermometer to test for doneness and remember to keep the thermometer in the meatiest part of the leg, away from any bone. When the middle of the meat reaches a temperature of about 145 F, it's time to take the meat off the fire. You want to let a leg of lamb rest for 20 minutes before carving it. This will even out the temperature, make sure it's completely done, and allow the juices to flow back into the meat. Carve the meat, starting from the thick end and work your way down to the shank, making small pieces.